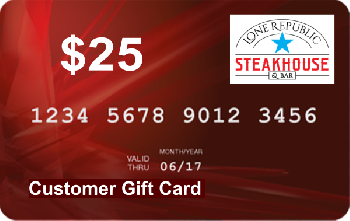 The Lone Republic Steakhouse 25.00 Gift Card is the perfect gift for family, friends, customers and clients to show your love and appreciation. The Gift Card has a 25.00 value pre-loaded and may be redeemed any time. There is no expiration date on the card. The Gift Card may be redeemed for all food, beverages, products and services offered by the Lone Republic Steakhouse. Alcoholic beverages are covered by the card, however, proof of age will be required. Cards may also be used to pay for tips to servers. Cards have no cash value and my not be redeemed for cash.